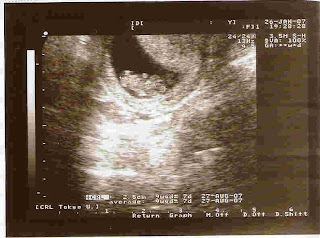 On 26/01/06...went for the third scan. Waitied for another good 10 mins...help the red hair nurse...not our turn yet?...then she said a few more....ok...wait some more....hehe. Daddy and Mummy went "Ohhhhhh!!!" Dr Adrain "Ok see you in two weeks time"
Happily went to update out appointments with the red hair nurse to come back 2 weeks time on 9 Feb...happily went out of clinc...walk walk to go eat...Mummy went "How to come on the 9th???!! !....Style Wedding Gathering leh!! !...unless we two are not going"...Daddy said "How can we no go leh...hehe"
Think can become a tour guide in Compass Point soon!!!! This is the second scan picture. 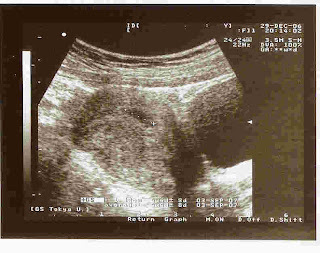 Dr Adrain say baby is 1cm...Daddy went huh?...the last time was 1.38cm...bb strunk? Dr Adrain nope...1.38cm the last time includes the water bag. Now 1cm is the baby. On a closer look to the picture...can see the head of the baby hor! Mummy say cannot see where is the head...Daddy say there there...blah blah blah...to be continued! On 090107, Daddy and Mummy went to Dr Adrain there thinking to sign the package before the coming visit. Go until there the nurse with red hair told us...come to sign the package only when come see doctor...no need special come down. On the right hand side is the package details. Unlimited visits, vitamins, scans if will to take up the package. Sounds very good lor! 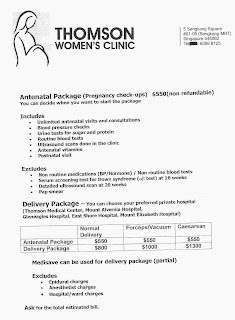 Private hospital to deliver: Thomson Medical Center or Mount Alvernia. Will sign up on the next trip...which is the coming friday. On 291206, Daddy and Mummy went to see Dr Adrain. Dr Adrain very cute...ask Daddy at least 5 times "Any questions"...Daddy go err...dun have...maybe too shocked to ask any questions. Dr Adrain confirm Mummy is carrying a baby. Using the ultra sound scanning equipment, Dr Adrain show where is the baby. It is the area with the dotted line. Measured at about 1.38cm. 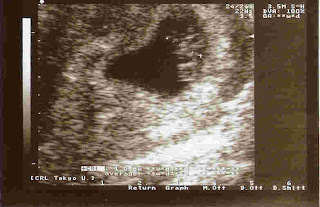 The estimated EDD is 03 September 2007. Dr Adrain no say anything about the EDD. Daddy and Mummy see from the scan picture bottom right hand side. Dr Adrain said "Will some vitamins to eat...come back 2 weeks time...why not consider to sign up the package...blah blah blah"
Daddy and Mummy to happy to hear out the rest of the blah blah blah!! Mummy checked out the Singapore Motherhood Forum for the gyne doctor to see...Concluded to see Dr Adrian Woodworth from Thomson Women's Clinic...because quite near to house...the clinic is in Compass Point...near to the bus interchange there...then asked Daddy to call them up to fix a appointment...so Daddy happily went down to the clinic. Upon reaching the clinic...opened the glass door...err...Daddy said "err...want to make an appointment for my wife to see Dr Adrian"...the nurse went "Oh Dr Adrain not in the clinic today...here is the schedule that he will be in the clinic...the rest of the time he will be in other places"...Daddy go OHHHHHHHHH...like that har...helpful nurse said "Call this number to fix an appointment"...Daddy happily went out of clinic...found a 'good parking space'...a previous public phone booth...parked and called the number..."Hello...will like to make an appointment to see Dr Adrain"...The voice over the other end went "Ok...coming friday...Dr Adrain will be in Sengkang branch...ok first come first serve basis...We start at 5.30"...Daddy went ok...left down Mummy's details...happily went home. Daddy and Mummy were anxious...just got a pregnancy test kit from Waston on Christmas Eve 24/12/06...if not wrong was in Plaza Singapura Waston....went home too tired to test so put aside. On Christmas Day (The Birth of Christ Jesus), Mummy get the test kit and used. Within minutes...hehe...2 blue lines...Yuppies!...Going to upgrade liao...hehe...HAPPY!!! So confirmed liao...God has sent Daddy and Mummy the prefect gift...The gift of life...Amen.